Nisreen Azzeh’s house sits high, up on a hill, in the Tel Rumeida area of the occupied city of Hebron (al-Khalil is the Arabic name of the city), in the south of the West Bank. 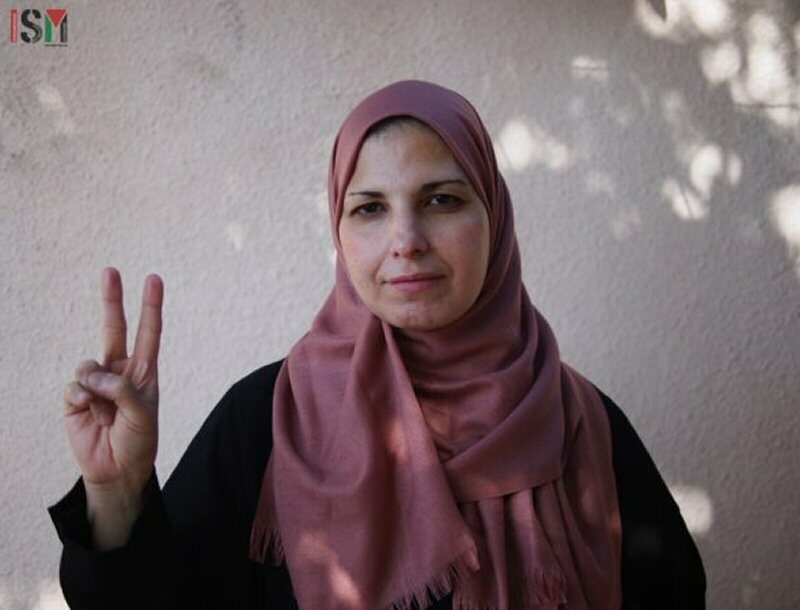 The way to her house is difficult to find, as the Israeli army blocked the main walkway after the death of her husband, a dear friend of ISM, in 2015. 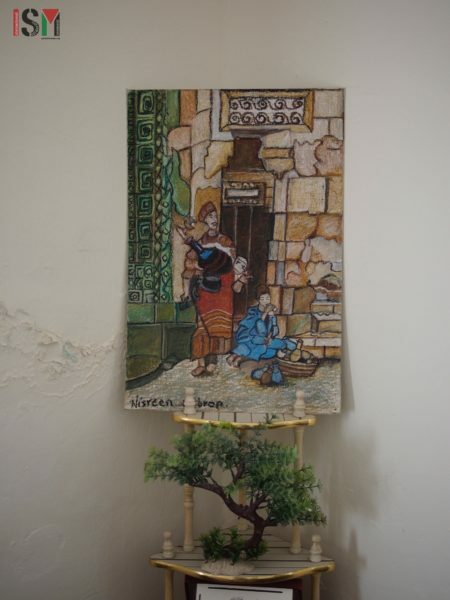 We climb the hill from Shuhada Street, emptied of normal Palestinian life a long time ago by the occupation, then find the way up an alley, then a short scramble up some rocks, through an olive grove, and find the door to Nisreen’s beautiful house. She is an artist, using oil pastels to express her feelings about the occupation of Palestine and the violence that she sees around her. 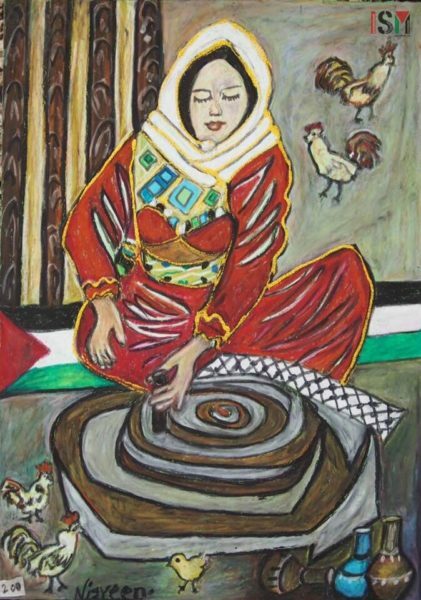 Some of her images are sad and some are celebratory, showing images of women clinging to their olive trees in front of Israeli tanks, protesting the occupation. Directly behind her house up the hill is the Tel Rumeida Israeli settlement, casting a long shadow over Nisreen and her family. Since the army closed the normal route to her house from the road, this uneasy path is the only way for Nisreen and her children to move to and from the house. We settle in at Nisreen’s and admire her artworks decorating the walls and table as she tells us her story. Nisreen was born to Palestinian refugees from the 1948 nakba, or ‘catastrophe’, when Zionist militias forced 700,000 from their homes in historical Palestine, in the brutal creation of the state of Israel. She met her husband Hashem in Jordan while she was studying art, and together they moved back to his home in Tel Rumeida, Hebron. Like other Palestinians living in occupied Hebron, she lives under several complex layers of the brutal occupation. 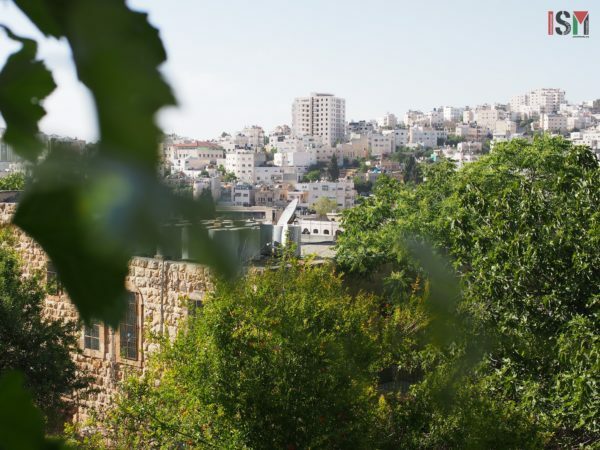 Hebron is the only place in Palestine where Israeli settlers live within a Palestinian city, and since 1997 has been divided into two parts: H1, under Palestinian control, and H2, under Israeli control. The 35,000 Palestinians living in the H2 area are subject to intense scrutiny and controls by the occupying Israeli forces, ostensibly there to protect the 500 or so Israeli settlers living in H2. Nisreen and her family, along with the other Palestinians in the H2 area of Hebron, experience the sharp end of the Israeli occupation, having to witness soldiers, checkpoints, border police and settler violence directed against them in a daily litany of militaristic abuse, alongside the more mundane humiliations of occupation: being stopped and searched, having a numbered ID card or not being allowed to open shops. Have a look at this short video to give you some idea of life for Palestinians living under Israeli rule in H2. 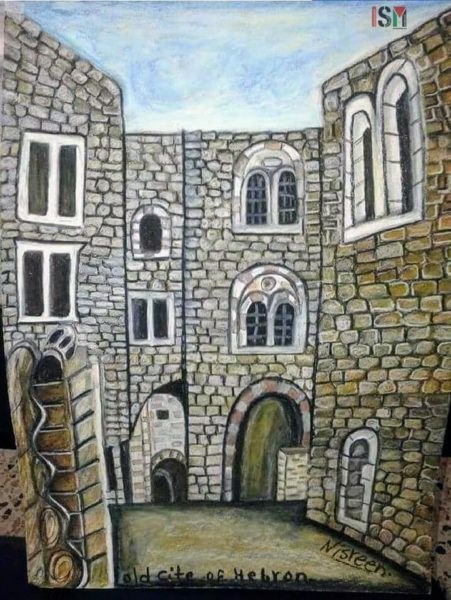 Nisreen has always produced art, but started to focus on her artwork more seriously during the second intifada, after 2000. At that time, her neighbourhood became a closed military zone, and it was difficult for people to go to their jobs. She tells us it was a challenging time. With movement around the city so restricted, they had to spend a lot of time at home, always witnessing the violence of soldiers and settlers, with few distractions. During this time, art became an escape for Nisreen, to channel her emotions into something productive, and a way of resisting. 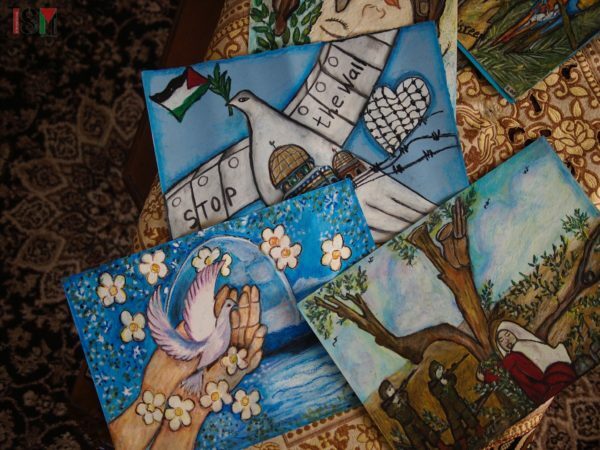 After encouragement by visitors to her home who saw her artworks, she began producing images for international buyers, and now sells her work all across the world for those looking to support a voice of resistance in Hebron. Perhaps the deepest cut of the occupation, for Nisreen, is the death of her husband Hashem, in 2015. Hashem gave tours for international visitors to show them the difficulties caused by the occupation in Hebron, and was known and disliked by Israeli settlers and forces. Read more about his life and work here. He was suffering with an ongoing heart problem, and, one day, was badly affected by tear gas thrown by Israeli soldiers against protesters, whilst he was taking a group of international visitors around the city. He returned home having trouble breathing and fell unconscious on the sofa. Israeli soldiers do not let ambulances get through to Tel Rumeida from the Palestinian controlled H1 area and, so, his friends carried Hashem to the checkpoint on Shuhada Street, to take him to the hospital. The Israeli soldiers at the checkpoint would not let them through for 10 minutes while Hashem was still unconscious. By the time he reached the hospital, in the H1 area of the city, he could not be resuscitated. Nisreen could not host his wake at her and Hashem’s house because relatives living in H1 would not be allowed across Israeli checkpoints to attend. When Nisreen returned to her house after the wake, Baruch Marzel, an extremist settler and member of the far-right Otzma Yehudit party who lives in the Tel Rumeida settlement, stood outside clapping, calling out, “Where’s Hashem?” Two soldiers stood nearby, pointing their guns towards her. Nisreen remains in her house with her four children. 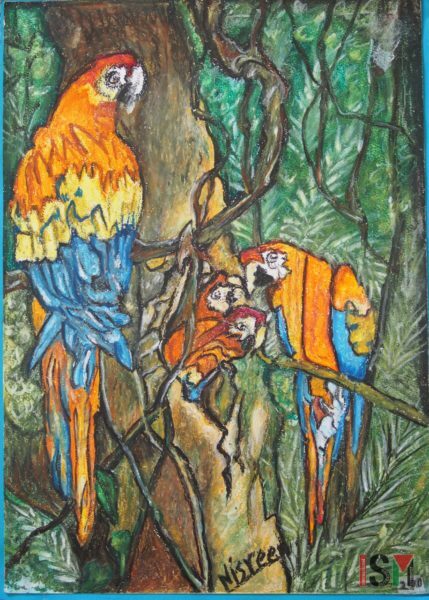 Selling her artwork is one of the only ways she has to support her family after the death of Hashem. She knows that the settlers nearby want to take the house and her land for themselves, which is why they direct a tirade of abuse and violence against her and her family. She is worried for her children seeing soldiers every day and witnessing the behaviour of the settlers. During heightened tensions, in 2015, the area of Tel Rumeida became a closed military zone for nine months, stopping all outsiders, including journalists and human rights activists, from coming to the area. She overheard a settler telling a soldier, in the street near the house, “I need to see Palestinians’ blood in the street.” Frequently the settlers scrawl “Kill the Arabs” on the walls of Palestinian houses in Tel Rumeida. Nisreen also lives with the memory of violent settler attacks against herself during the second intifada. On two occasions, women from the settlement came to her land, threw stones and shouted ‘go and die in your home’. After both attacks, Nisreen miscarried, once at three months and once at four months. The incidents didn’t lead to any prosecutions, which is not overly suprising as impunity for settlers’ violence is the norm in occupied Palestine: see here and here. Despite the settlers’ attempts to intimidate Palestinians like Nisreen, she refuses to give up her land to them. The soldiers come and invade the house a few times each year, checking the house, taking measurements and messing everything up in a deliberate provocation. She knows they are sizing the house up to support a settler invasion. They haven’t come yet in 2018 but she is prepared to be steadfast when they do. She tells us, “I will not leave my house, I am not leaving here. I resist here. I called to Baruch Marzel [when he taunted her after Hashem’s wake] ‘I live here. Hashem died but I live here.’ I am here, I resist.” Her artworks encapsulate Nisreen’s quiet and determined resistance to the racist bullying of the nearby settlers, supported by the full force of the occupying Israeli army. Some are sad, some are hopeful, all are beautiful, and importantly, they are her voice to the world from her struggle here in Hebron, Palestine. It is a voice that refuses to be silenced. 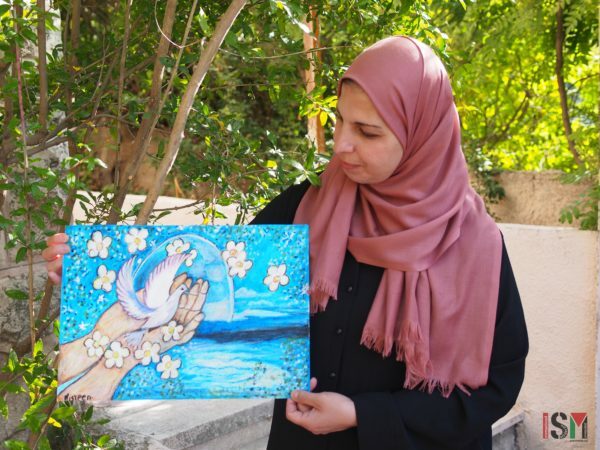 To purchase Nisreen’s unique artworks and support her voice of resistance in occupied Palestine, please visit her website (mobile site under construction – please view on desktop).